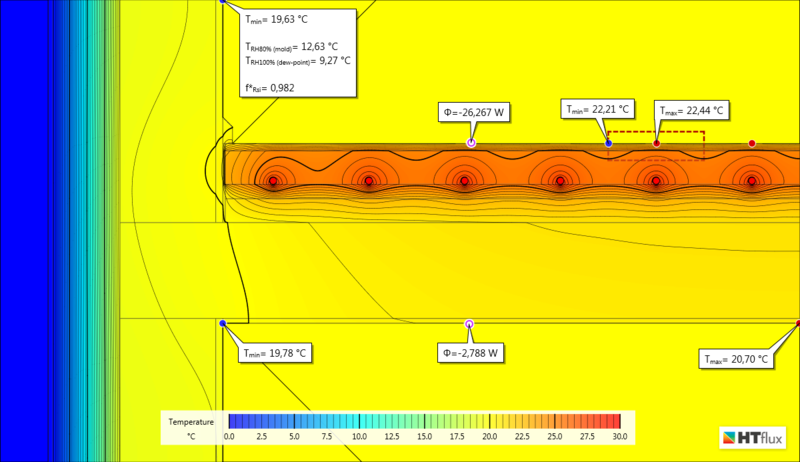 The following example demonstrates the thermal simulation of a warm water underfloor heating system. 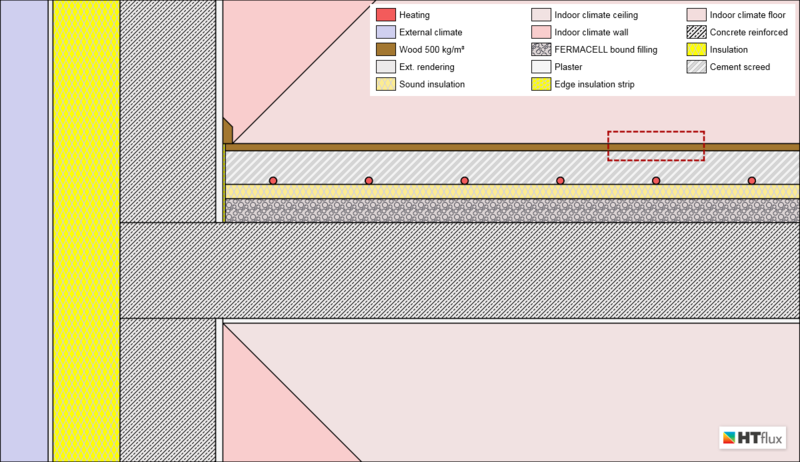 The task is to examine the temperature- as well as the energy-distribution resulting from the underfloor heating in an internal floor with wall connection. To process the simulation, a set of boundary conditions had to be set. Find these values at the bottom of this page. A number of interesting new insights can be obtained of the simulation: e.g. the so-called waviness of the temperature profile of the floor can be determined. In the present example the surface temperatures of the wooden floor vary in a range from 22,2°C to 22,4°C. Hence the amplitude of the waviness is 0,2°C. It might also be of some interest how much of the heating energy is delivered to the ceiling of the bottom floor. 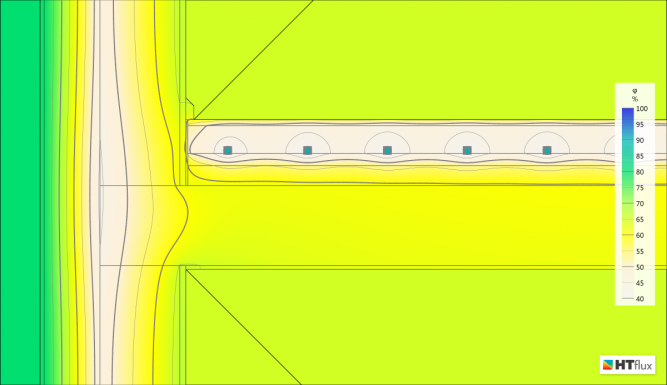 To calculate this portion it is necessary to redo the simulation with the heating “switched off”, keeping room temperatures at the given 20°C. Doing this we are able to determine the heat loss caused by the wall’s thermal bridging effect, on the upper floor as well as on the lower floor. These values represent the initial values to calculate the effect of the heating. The difference of these simulations values enable us to calculate the total energy input of the underfloor heating system as well as the portions distributed to the different floors. 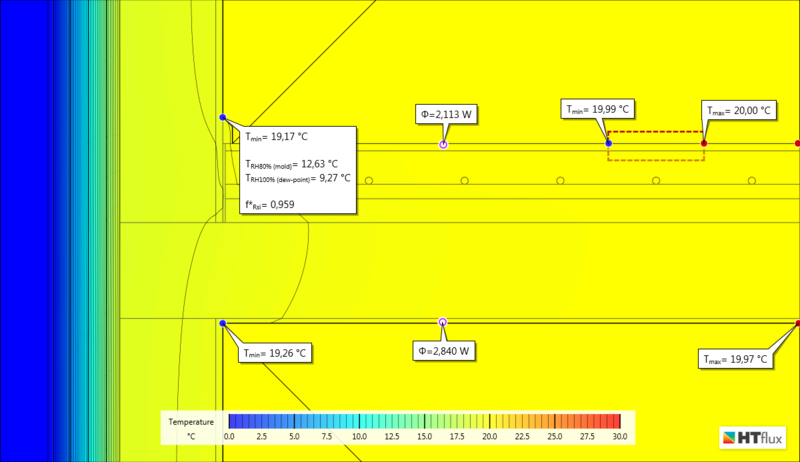 Hence the total heating output of the underfloor heating system is 34 watts in the area simulated. A portion of 16,5% is distributed to the lower floor. 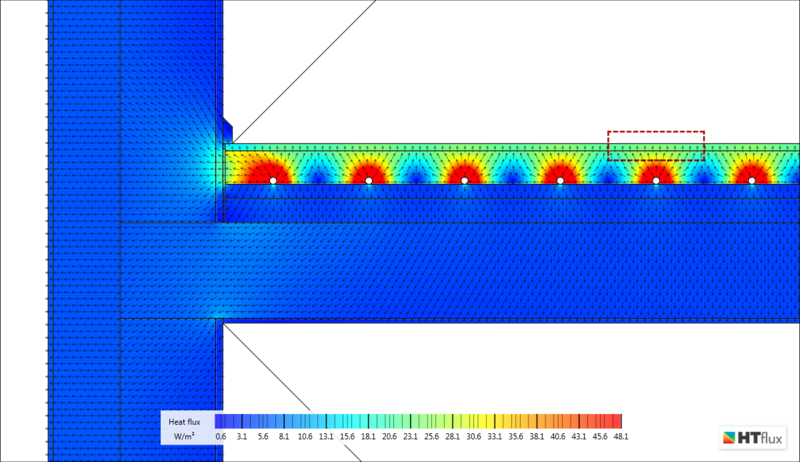 The effective input to the upper floor is 26,3 watts (=upward heating output minus the loss due to thermal bridging). Of course the total heat flux as well as the portion is dependent on the temperatures assumed. You can clearly see how the active underfloor heating causes a low humidity within the cement screed. The exterior wall is made of 20cm reinforced concrete, insulated with a 14cm EPS layer (λ=0,39). Note: You are permitted and encouraged to use images from this page or to set a link to this page, provided that authorship is credited to “www.htflux.com”.